This beautiful mansion, designed by Ann Arbor architect Rupert Koch, has survived a difficult history. The original owner, Leander J. Hoover, founded the Hoover Steel Ball Company in Ann Arbor in 1913. Very much a self-made man, Hoover learned about the manufacture of ball bearings as he worked his way up the ladder from the age of 16. He established his first plant, the Grant Hoover Company, at Merchantville, New Jersey in 1906. The fine quality of Hoover bearings, and the advent of World War I led to the brilliant success of Hoover's company. He became very rich very quickly. Hoover began his $350,000 "French Chateau" in 1917. Set in extensive beautiful gardens, his new home had a small theater and a ballroom on the third floor. The 24 acre site also included a greenhouse and gazebo. Sadly, after a long illness complicated by influenza, Hoover died in September of 1918. His family remained in the house a very short time thereafter. In 1922 the house was purchased by the Kappa Sigma fraternity. It was vacant during the 1930's and in 1945 it was almost razed by the city. Instead Mr and Mrs. Carroll Benz purchased it at auction in 1946. They renovated it and later sold it to Tau Delta Phi fraternity in 1950. In 1968 the house became the headquarters for Youth for Understanding, a cultural exchange program for students worldwide. When Y.F.U. moved to Washington, D.C. in 1978, the house again stood empty. Later that year, just prior to its purchase by Group 243 Inc., an advertising firm, the house received a cosmetic makeover as a "designer showcase" to raise funds for Mott Hospital. 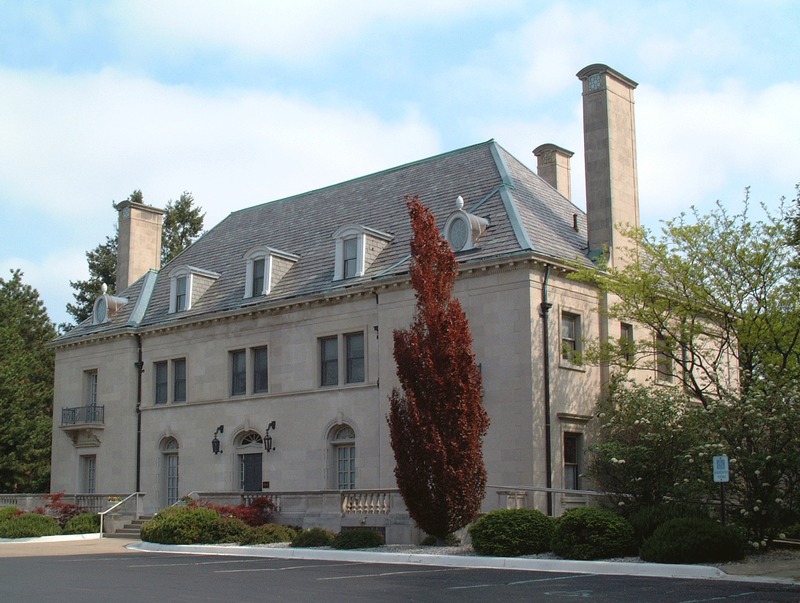 In 1983 the Patton Corporation bought the mansion and leased it to General Automotive Corporation. The house and its sweeping front lawns, as impressive as the house itself, have been renovated and the original carriage house reunited with the property.